Founded by Henry Francis du Pont, Winterthur (pronounced Winter-Tour), once the backdrop for the party extraordinaire, is the premier museum of American furniture and decorative arts nestled in the northwestern edge of Delaware in the beautiful Brandywine Valley. Known to his friends as “Harry,” Mr. du Pont was an innovator and a leader in farming, gardening, art, and antique collecting. He was remembered fondly for his skills as the ultimate host at meticulously planned parties and country weekends. Some of Harry’s friends who attended Winterthur weekends were Brooke Astor, Doris Duke, Jackie Kennedy and Prince Rainier. Harry understood the importance of every detail of his parties from flowers to the menu in creating a comfortable and inviting ambience. No doubt adding the right table lamp or chandelier helped to create a warm atmosphere. For more than twenty years, Currey & Company has partnered with Winterthur to craft lighting, furniture and rugs inspired by Mr. du Pont’s collections and from the rich archives housed in their library. 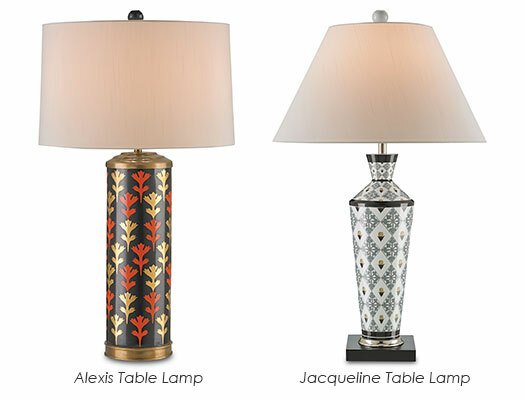 Hand-painted stylized floral motifs grace porcelain lamps Alexis and Jacqueline as a tribute to Mr. du Pont’s love of flowers. Design inspiration was found in the 1881 edition of the highly influential book Suggestions in Floral Design by Frederick E. Hulme, an English drawing instructor and amateur botanist. The book is housed in the Winterthur library. The intended use of these designs was for wallpaper, carpets, tiles and any surface in need of decoration. Tom Caldwell, VP of Currey’s Design Department, beautifully interpreted these floral inspirations into modern lighting. Selecting historically accurate furnishings was imperative to Mr. du Pont. 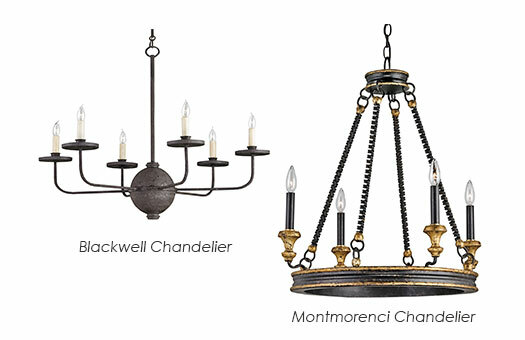 A charming colonial–style chandelier hanging in the period Gray Room at Winterthur was the inspiration for the simple, wrought-iron Blackwell Chandelier. The textured, hand-applied Molé Black finish and crimped candle cups add a rustic element to the light fixture. The Montmorenci Chandelier was named after an 1822 house in Warren County, North Carolina where Mr. du Pont purchased and transported to Winterthur a grand, circular staircase which is installed in the 1902 wing of the house. A wall sconce located in the Empire Parlour was the inspiration for this striking chandelier. Unusual corkscrew cables and a Spanish Gilt finish give this four light chandelier a distinctive European feel. This entry was posted in Currey & Company, Entertaining, Products and tagged black, Chandeliers, design influencers, Floral, Gray, Lighting, Table Lamp, White, Winterthur, Wood on October 21, 2014 by Currey & Company.